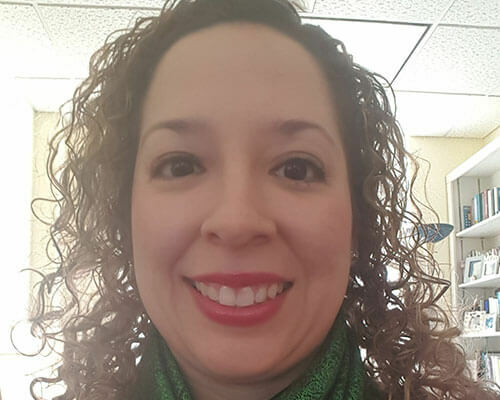 Home » Academics » Schools » College of Arts, Humanities and Social Sciences » Faculty » Margaret Cantu-Sanchez, Ph.D.
University of Texas at San Antonio, Ph.D.
Margaret Cantu-Sanchez was born and raised in San Antonio, Texas. She is an alumna of St. Mary’s University English undergraduate and graduate programs. St. Mary’s holds a special place in her heart for numerous reasons including the fact that her aunt, brother, sister-in-law, and husband graduated from there. St. Mary’s was the place where Margaret honed her teaching skills in preparation to teach high school and it was the first place where she taught college level courses. At St. Mary’s, Margaret also had the opportunity to take part in the London Study Abroad Program and the 5-Year English Degree Teaching Certification Program. St. Mary’s is where Margaret met her husband and they now have 2 rambunctious children together. After St. Mary’s, Margaret taught high school English for a time and soon decided to pursue a Doctoral degree at The University of Texas at San Antonio. It was at UTSA that Margaret became immersed in Chicanx/Latinx Cultural Studies and Literature. After UTSA, Margaret taught at numerous institutions in San Antonio including: UTSA, Our Lady of the Lake University, and Palo Alto, eventually ending up back at St. Mary’s. Margaret has been teaching at St. Mary’s for three years now and enjoys exposing her students to Multi-Ethnic and Chicanx authors, literature, and culture. Her approach is one that simply asks students to contemplate the importance of their identity and place in the world in relation to the literature they read. 2018 “Norma Elia Cantú’s Canícula (1997) and Gloria Anzaldúa’s Borderlands, La Frontera (1987) in a Multi-Ethnic Literature Classroom. Teaching Mexicana and Chicana Writers of the Twentieth Century.” MLA Options for Teaching, Ed. Elizabeth C. Martinez. 2016 “In/civilities of the American Classroom: A Clash between a Chicana Teacher and an Anglocentric School System” El Mundo Zurdo 5: Selected Works from the Meetings of the Society for the Study of Gloria Anzaldúa 2015. San Francisco, CA: Aunt Lute Books. 2011 “A Mestizaje of Epistemologies in American Indian Stories and Ceremony.” Nakum Journal. Vol. 1-2. San Marcos, TX: Indigenous Cultures Institute. 2010 Cantú, Margaret. “Embracing Gloria Anzaldúa’s Borderlands/La Frontera as Multicultural Pedagogy,” in El Mundo Zurdo: Selected Works from the Meetings of The Society for the Study of Gloria Anzaldúa 2007 & 2009. San Francisco, CA: Aunt Lute Books. “Reaching Conocimiento: Personal Stories as Healing and Coping with Cultural Identity Conflict in the Literature Classroom.” El Mundo Zurdo: International Conference on the Life and Works of Gloria Anzaldúa, 2018. “Bridging American and Mexican Cultures and Reinforcing Chicana/o Identity in the Nepantla Classroom.” El Mundo Zurdo: International Conference on the Life and Works of Gloria Anzaldúa, 2016. “In/civilities of the American Classroom: A Clash between a Chicana Teacher and an Anglocentric School System,” El Mundo Zurdo: International Conference on the Life and Works of Gloria Anzaldúa, 2015. NACCS Tejas Regional Conference, February 2014. “Chicana Education Testimonios as a Methodology of a Mestizaje of Epistemologies,” NACCS XL, March 2013. “’Healing the Split:’ Reconciling Cultural and Academic Epistemologies in Latina Testimonios.” Mujeres Activas en Letras y Cambio Social (MALCS) Summer Institute, University of California Santa Barbara, July 2012.